An opportunity to explore the underwater world without having to dive is something that many of us would love to experience! This is even more so for many small-scale fishers from the Western Cape’s Kogelberg area, who spend most of their time at sea, yet have never seen the life beneath. Now, through innovative design using simple technology, these fishers can tell you exactly what type of marine life exists along their coast. The Kogelberg coast is an important conservation area for many threatened linefish species, such as the red roman pictured here. If, like me, you have been lucky enough to visit the Stony Point African penguin colony in Betty’s Bay, or driven along the coastal Clarence Drive from Gordon’s Bay towards Botrivier, then you have witnessed some of the natural beauty of the Kogelberg coast and its unique Cape fynbos. This area is renowned for its extraordinary biodiversity – on land and at sea – and has been declared a world heritage site. The region is also home to some of the Western Cape’s original fishing communities, including Kleinmond, Pringle Bay and Betty’s Bay. Most of these coastal communities have been fishing for centuries and are highly reliant on the ocean to earn a living. With so much dependence on the sea for food and income – one can only imagine how threatened the livelihoods of these sea-going people are from a decline in key marine species. This is even worse considering the high levels of unemployment they are facing. The decline of commercially important marine species is something that many people find difficult to accept, and so was the case with the Kogelberg fishers until recently. 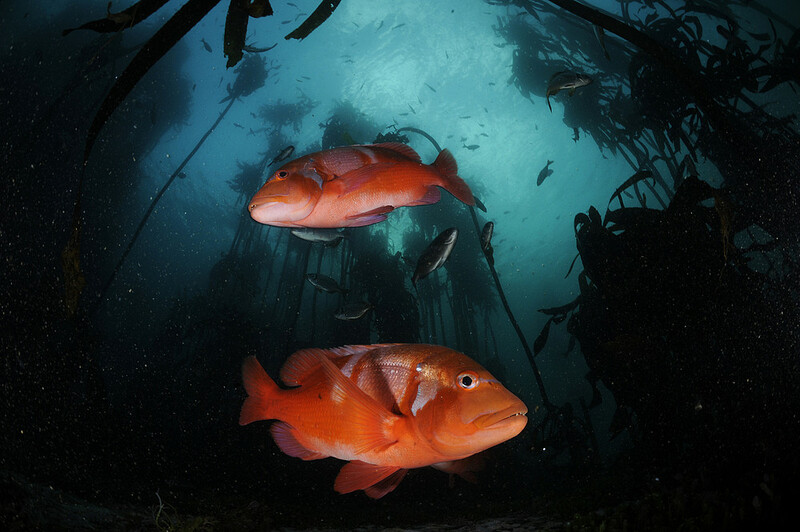 Using a simple underwater camera system known as a Baited Remote Underwater Video (BRUVs), local fishers can be part of the data gathering and are then able to see the marine life on the ocean floor, both in and outside of the Betty’s Bay marine protected area (MPA). From this captured video footage one can compare species diversity, relative abundance and the behaviour of fish inside the MPA to those outside of the MPA. Once upon a time, fishers were dependent on scientists and government authorities for information on fish stock levels. Now, they can witness the relative abundance – or scarcity of a species – for themselves! What is BRUVs and how does it work? The BRUVs consist of a video camera and a bait container with chopped-up fish, both of which are attached at the opposite ends of a metal structure known as a rig, which in turn is attached to a long rope with a buoy. WWF’s Sindisa Sigam (right) with Angelo Jansen (left) demonstrating how the camera and bait container are set on the rig before it is deployed at sea. On a good weather day, a crew of about five to six people – consisting of a skipper, scientist and local fishers, and in some cases with WWF’s project leader – go out to sea with about four rigs on board. 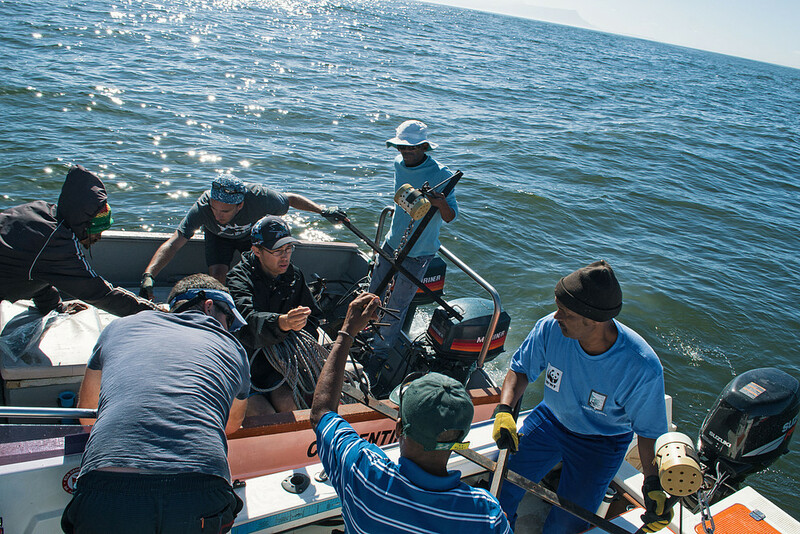 A boat crew exchanging BRUV rigs in one of the sites in the Betty’s Bay marine protected area. Once at sea, the rigs are lowered at pre-determined and set GPS points inside and outside the MPA. They are left for an hour to record the activity in that particular area. The cameras can be lowered as deep as 50 metres on the sea floor! After an hour, the boat returns to haul up the rig to be deployed in other pre-selected areas. When using two boats with four rigs each, a total of 40 sites are covered in approximately 4 to 8 days depending on weather conditions, water visibility and the landing of the rig. For the WWF project, data is gathered bi-annually – in summer and in winter. Like with any other research project, data needs to be captured and analysed. With BRUVs, that means watching video footage from each site closely. Each recording can take about two hours to scrutinise. Like me, you may agree that watching such videos, from the 40 sites, of underwater life could be fun. But not everyone thinks so – especially when you have to watch carefully and focus. WWF did not struggle to find the right people for this job. Two young men from the area showed enthusiasm to conduct BRUVs data analysis. 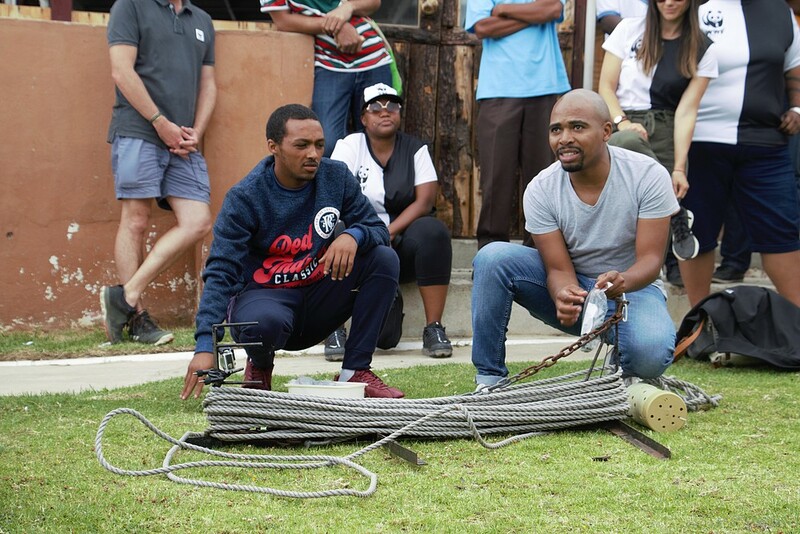 They are part-time employed and were specially trained to analyse the video footage and then shown how to input the data into an online system, which is then verified by scientists from the South African Shark Conservancy in Hermanus. 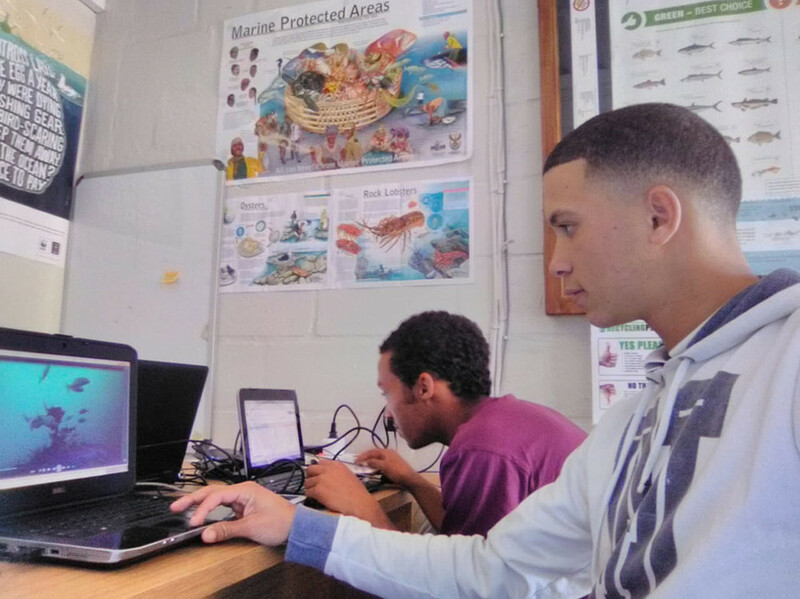 Marcelin Barry (front) and Angelo Jansen (back), the two youngsters from the Kogeberg who analyse data before they send it to scientists for verification at the South African Shark Conservancy in Hermanus. Through this work these two have learnt so much about fish, from identity and diversity to habitat and behaviour, making them “fish experts” in their community. Their enthusiasm did not only earn them a part-time paid job, but it has advanced their skills, knowledge and love of the sea. I could hear the passion in Angelo’s voice as he was telling us about his role in the project, when my WWF colleagues and I visited a few months ago. There is definitely nothing as rewarding as doing something that you love! My colleague who leads on the project, Sindisa Sigam – WWF’s Small-scale Fisheries Co-ordinator – says involving the community in this fish monitoring research is making a positive difference. He also shared how the relationship between the community and the authorities has improved considerably. Participating fishers in the community are really beginning to understand and appreciate the role and value of an MPA, and they always look forward to another day of exploring the underwater world, while learning and growing to appreciate it more and more. Kogelberg is certainly not the only area where key marine species have been overfished. WWF has secured funding to expand the BRUVs project to the Eastern Cape, in the town of Hamburg, between Port Alfred and East London. However, this does not mean that the work in Betty’s Bay is over. The WWF project here will continue for another five years, creating more job opportunities and skills development in both areas. What my journey to the Kogelberg area has shown is that this is not just another scientific research project, but an opportunity to invest in local coastal communities and provide hope for the future of our shared oceans. 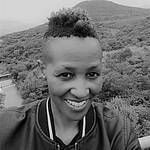 Dimpho believes in the power of science communication, because it is through knowledge sharing that people can learn and change their behaviour. Explore more of WWF's oceans work.